Arron Banks will not be a panellist on the BBC's Question Time next week, amid controversy over recent TV appearances. The businessman, whose donations to Leave.EU during the 2016 Brexit referendum are the subject of a criminal investigation, was billed to appear in Milford Haven on 15 November. 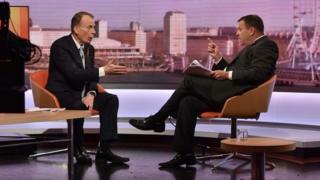 However, he tweeted that he had been "bumped" from the weekly programme, which is hosted by David Dimbleby. The BBC said Question Time panels "are never fully confirmed until broadcast". The National Crime Agency is investigating Mr Banks and his Leave.EU campaign for alleged offences committed during the 2016 EU referendum following information passed to them by the Electoral Commission. Mr Banks has denied any wrongdoing and insisted the £8m he loaned to Leave.EU was legitimate and came from his UK insurance businesses. He was challenged to explain where the money for his Brexit campaign came from during an interview on the BBC's Andrew Marr programme last Sunday. His appearance was criticised by a number of politicians who argued it was wrong to give such a high-profile platform to someone facing a criminal investigation. The BBC said the interview was in the public interest. It has since emerged that Leave.EU and an insurance company owned by Mr Banks are facing fines of £135,000 over breaches of data laws following an investigation into the misuse of personal data by political campaigns by the Information Commissioner's office. Current affairs discussion show Question Time is produced for the BBC by Mentorn Media. At the end of last week's show, Mr Dimbleby said "believe it or not, at the moment at any rate, Arron Banks is going to be on the panel" in two weeks' time. Mr Banks indicated on Twitter that he would not be appearing. Labour peer Lord Adonis, who has complained to BBC management and regulator Ofcom about what he says is the undue prominence given to Mr Banks, welcomed the decision.